We have breakfast (scramblers, burritos, plates, and egg sandwiches), lunch and dinner items. Fried foods such as chicken tenders and fries, poppers, mozzarella sticks in addition to salads, cold and hot hoagies. 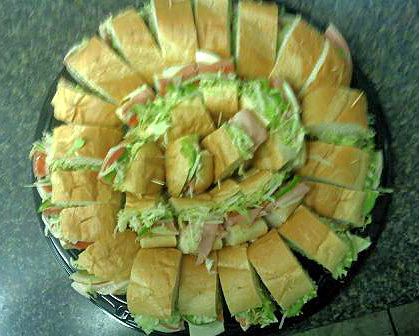 Our most popular cold hoagies are the Italian, Chicken Salad, and Turkey Club; Popular for hot hoagies are the Steak Deluxe, Pastrami, and Chicken Parmesan. Visit the drop-down menu at the top for a full listing of menu items. All of our hoagies are served on rolls from Piantedosi Baking Co., delivered to us daily- fresh from the bakeries. Copyright 2013 Doug's Hoagies. All rights reserved.